The HuffPost presidential forecast model dedicates Democrat Hillary Clinton a 98.2 percent chance of winning the presidency. Republican Donald Trump has essentially no track to an Electoral College victory. Clinton’s win is likely to be substantial, but not overwhelming. The model projects that she’ll garner 323 electoral referendums to Trump’s 215. Yes, I utilized 270 To Win. It’s a great tool. 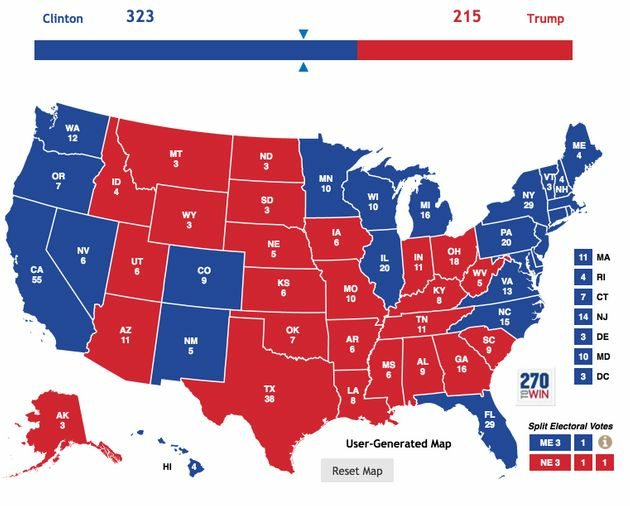 For all of 2016’s craziness, that projection actually follows a reasonably traditional electoral map. Trump should keep Arizona and Georgia, even though Clinton is likely to make it a closer-than-usual race. Iowa also seems firmly in Trump’s column. All three nations are more than 85 percentage likely to remain red. Florida, Nevada and North Carolina have leaned toward Clinton in the polling averages. The forecast in recent weeks, along with the strength of early voting numbers, attains it seem very likely that these will stay with her. All three states are more than 80 -percent likely to swing Democratic. New Hampshire polls have wavered recently, but the HuffPost model still predicts those four electoral elections will go to Clinton with more than 90 percentage certainty. And Clinton should fairly easily hold onto Michigan, Wisconsin and Pennsylvania. That leaves Ohio as the last critical state. It’s the closest in the race, according to the HuffPost forecast model. Trump results by merely 1 phase, and the polling trend has moved toward the GOP in the last few weeks. The HuffPost model gives Trump about a 70 percent opportunity of winning the nation. In the event that Clinton’s ground game induces turnout and pulls Ohio in her direction which is not out of the question she’ll get 341 electoral votes. Maine’s 2nd Congressional District and Nebraska’s 2nd Congressional District could defy their states’ tendencies, but there’s no substantial polling information to indicate whether that will happen. In the absence of data, I’m choosing not to divide them in projections. Third-party candidates aren’t likely to be a factor. Independent Evan McMullin will probably take a sizable share of the voting in Utah, but not enough to beat Trump. Libertarian candidate Gary Johnson has been polling at 5 percentage or less on average. And Green Party nominee Jill Stein isn’t likely to pull much of the voting in the states where she’s on the ballot. The Senate is likely to shift to a Democratic majority, with 51 seats, or 50 seats and Tim Kaine as the vice presidential tie-breaker. The HuffPost model says there’s a 66 percentage opportunity Democrat will get 51 or more seats, and a 25 percentage chance the chamber ends up with each party at 50 seats. Republicans have had 54 seats to Democrats’ 46 since the 2014 midterm elections, but Democrats might get just enough seats to retake control. The key Senate races likely to switch to Democratic from Republican are in Illinois, Wisconsin, Pennsylvania, New Hampshire and Indiana. The HuffPost Senate forecast model devotes those races fairly high likelihoods of switching to Democratic hands. If all five states shifting, Democrats will have 51 seats. If our model has Indiana incorrect, Democrats will have 50 seats and will require Kaine’s vote to break ties. Indiana’s Senate race between former Sen. Evan Bayh( D) and Republican candidate Todd Young has been eventful. Young was almost certain to win until Bayh jumped into the race over the summer. Bayh had a substantial leading for most of the campaign, but that has fallen precipitously in recent weeks due to revelations that he hasn’t been living in the state. The HuffPost model still dedicates Bayh a sizable result and an 88 percentage chance of winning. Some recent polls released in Indiana present Bayh’s lead evaporating, but those surveys haven’t fulfilled HuffPost Pollster’s standards for transparency. Some pollsters active in the state repeatedly didn’t answer our inquiries or refused to provide the full information we requested. Per our standards, we didn’t include those polls. This could be one case where that standard hurts our prediction. Indiana has strict polling laws and doesn’t get a lot of polling activity. So, while losing a few polls wouldn’t hurt in most nations, it could in Indiana. We’re willing to take that reached to stand by our standards. Incumbent Illinois Sen. Mark Kirk has been consistently out-polled by his Democratic challenger Tammy Duckworth. This one looks like a pretty sure thing Duckworth is more than 10 phases ahead on average, and has a 99 percentage opportunity of winning. The Wisconsin race features a rematch between Sen. Ron Johnson( R) and former Sen. Russ Feingold( D ). Johnson beat Feingold in the Republican wave of the 2010 midterm elections, but Feingold is likely to retake the seat. His leading has shrunk in recent weeks, but the Democrat is still leading by more than 4 points, devoting Feingold a 98 percent chance of winning. Pennsylvania Democratic challenger Katie McGinty has steadily increased her polling lead on incumbent Sen. Pat Toomey. She’s 3 points or 4 points ahead of Toomey, and has a 97 percentage chance of winning, according to HuffPost’s model. There are two other candidates in the race, though, and that could shift the race in one direction or the other. But this one is called for McGinty. New Hampshire’s race features former Democratic Gov. Maggie Hassan against incumbent Republican Sen. Kelly Ayotte. This race has been back and forth, but Hassan has the upper hand going into Election Day. Her slim lead is enough for the model to give her an 80 percentage opportunity of defeating Ayotte. This is one to watch, though. Nevada and Missouri have relatively close races as well, but will probably not change party hands. Sen. Roy Blunt( R-Mo .) is struggling to maintain his seat, and has a 59 percentage chance of maintaining it. Missouri’s status as a typically red state is very likely assist Blunt. Nevada is voting to replace retiring Sen. Harry Reid, and Democrat Catherine Cortez-Masto has a 63 percentage chance of defeating Republican Rep. Joe Heck.